Durgin Park is a famous restaurant located in the North East of the US. This is a creamy corn pudding, this dish shouldn’t be missed. This is the perfect dish to put in the oven while other dishes are in there. Corn pudding is a perfect dish for the fall. 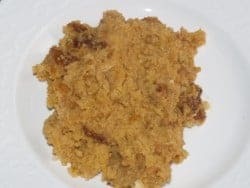 Make Durgin Park Indian Pudding at home. Mix all ingredients thoroughly with one-half the hot milk and bake in a hot oven until it boils. Then stir in remaining half hot milk and bake in a slow oven for five to seven hours. Bake in a stone crock, well greased inside. Could this be done in a crockpot? The first part on high and the second on low? It sounds so good but I don’t have a stone crock. I don’t see why it couldn’t be done in a crockpot, I would try the first part on high like you mention and then on low. Honestly, I think it may be easier to prepare in a crockpot!